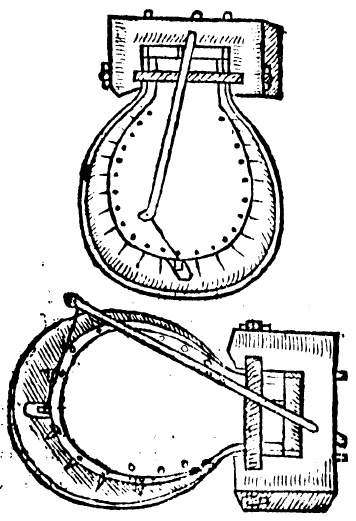 In 1590, Leonard Mascall recorded two traps, which he called “Dragin traps”. 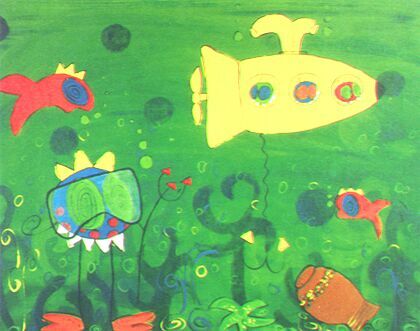 The following reproduction and replica are from David Drummond (1992 and 2005, for originals see appendix below). The first one (see right) has two twisted cords as its power source and the striker board is inserted between the twisted cords. 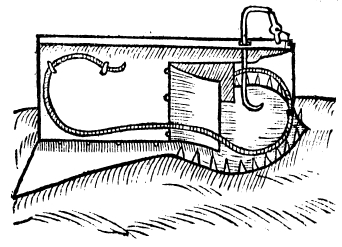 Mascall (1590) called it “Dragin trappe for Mice or Rattes”. Actually, the stiker board looks like a bat and the handle of the bat is inserted between the twisted cords. The second one (see left) has a wire forming both power source and striker. Mascall (1590) called it “Dragin trappe with a great wyar”. If material culture is evolving, one question is how to get from a trap with twisted cords as power source to one with a wire spring. Going one step at a time, you would have to replace the twisted cords by twisted wires, in order to be able to insert the striker board between the wires. In my opinion, twisted wires would be a poor power source. Apart from that, I do not see how to get from two twisted wires with a striker board inserted between to one wire with curved or coiled ends serving as power source and a middle loop serving as striker. 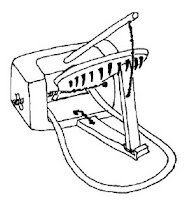 The only one-step-at-a-time solution would be to form the wire spring in such a way that it has a middle loop to which the striker board can be fixed. Searching for traps with this design I found two patents. The first patent is from William Wrigh (1860), Philadelphia, PA. The figure at the left is taken from that patent. The side view (Fig. 3) shows the striker board e with spikes being pressed down by the wire a. The top view (Fig. 4) shows that the wire a is actually the middle loop of a spring being coiled at both ends. The trapy type is L-shaped, which once was a large group of traps with considerable variability in design. 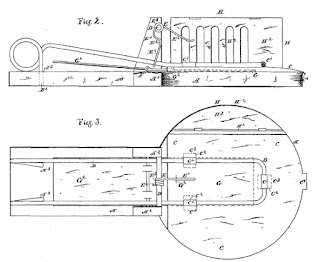 The second patent is from Carl J. Erikson (1887), Rockford, IL. The figure at the right is taken from this patent. It looks complicated, but the relevant part is the striker board c, which is fixed to the middle loop of the spring wire B. As an aside, part H is a bait box, an odd feature of this particular patent. The inventor thought that the mouse would be attracted by the bait in this box walking around it to look through the windows in the bait box. As the windows were at the side of the striker and the tradle, the mouse would release the trap when looking through the windows. The round base seems to be a heritage from the older dragon-traps (why else should the base be round when actually a rectangular base would be far more practical for accommodating the bait box? Admittedly, these trap patents are from a later period than the dragon-traps, but I suggest that they could represent a missing link in spring/striker design. A striker board is fixed to the middle loop of the wire spring. But now the striker board is utterly redundant. The middle loop of the spring only needs to be formed in such a way that it can carry the striker function on its own. Et voilà, a Dragon-trap with spring/striker unit ‘evolved’. There’s more to Dragon-traps. For example, the set-release mechanism changed from suspended to hinged striker.Therefore, a second missing link would have to look like the one above except for having a treadle and suspended striker instead of bait hook and hinged striker. P.S. 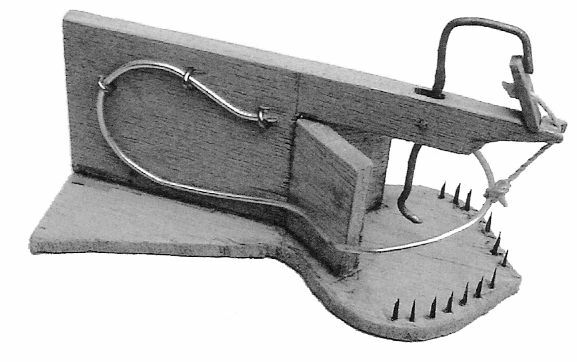 : The younger history of mouse traps shows that they (and by implication other irreducibly complex systems) can have precursors with one part less and therefore can evolve (see Behe's mousetrap nemesis). Actually, both are top views rather than a front and a top view. Dagg J.L. (2011) Exploring mouse trap history. Evolution: Education and Outreach 4: 397-414. Drummond D.C. (1992) Unmasking Mascall’s mouse traps. Proceedings of the Fifteenth Vertebrate Pest Conference. DigitalCommons@University of Nebraska, Lincoln. Accessed on: 21 Sept 2008. Erikson C.J. 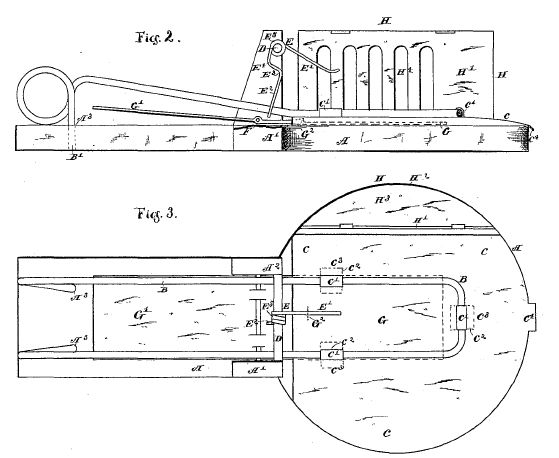 (1887) Trap. Patent no. 365,058. United States Patent Office. Wright Wm. (1860) Animal-trap. Patent no. 28,820. United States Patent Office.